You can pre-order a hardback or e-book of Everything I Know About Business I Learned From the Grateful Dead on Amazon. †Publication date is November 2. Last week I received my copy of the limited edition ìEurope 72: The Complete Recordings,î the giant 73 CD boxed set of all 22 of the Deadís performance from the legendary Europe í72 tour.† Itís quite an amazing package and one thatís been at the top of the wish list of Deadheads for a long time including me.† As I began to listen to the shows all presented in outstanding quality, I recognized how Dead.net and Rhino have mirrored several of the Deadís business lessons I present in my book. First is to be responsive to customers. †The Dead were nearly always responsive to fans from their earliest days in 1965 till the end of the road in 1995.† Fans grew to love their live performances and the Dead became a touring band so fans could see them play frequently rather than simply when a new album was released.† Deadheads have been wishing for the complete European tour since it happened because the band was in rare form throughout the 42-day tour.† Although the Dead released ìEurope í72î a 3-record set in 1973 and several other CDs from the tour have been released more recently, nothing came close to granting the wish and being responsive until this new, complete package. The second lesson is to embrace technology, something else the Dead always did whether it was in their sound system, lighting or instruments.† Dead.net and Rhino have really followed this lesson by going back to the original 24-track master recordings, carefully digitally remastering them, and then using new technology (plangentprocesses.com) to insure the finest possible listening experience.† Iím a pretty serious audiophile, and these new recordings are spectacular just like the incomparable audio experience I always found at a Dead show where the Dead used technology to insure that everyone in the audience had the best possible listening experience. The third lesson I recognized providing value to customers.† The Dead intentionally kept their ticket prices low throughout their history to allow fans to afford to see them play.† While the price of this boxed set is very high at $450, it works out to only $6 per CD including shipping.† Thatís less expensive than the Dicks Picks series or the current Road Trips series now being offered.† So the boxed set provides tremendous value despite the high price tag. To see all 10 of the lessons I learned from the Grateful Deadís business practices and how your business or organization can benefit from them, you can pre-order my book on Amazon.† It hits the bookstores November 2. 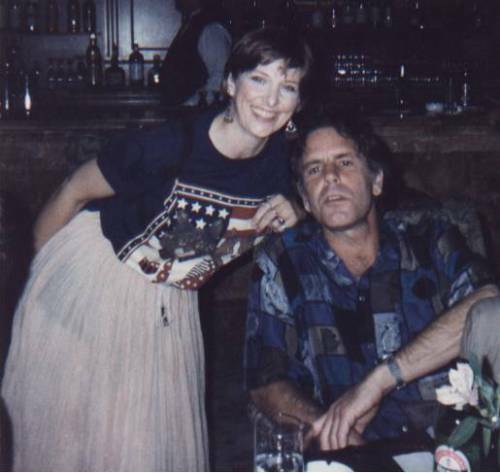 My wife, Chris, and Bob Weir before our last concert on July 6, 1995. August 9, 1995 was the saddest day of my life. †Jerry Garcia died that day and it meant the end of the moveable feast that was the Grateful Dead. †Having followed the band for 21 years seeing 194 shows, making many close friends and always looking forward to the next tour, it was a heartbreaker for meÖand many, many others. So what business lesson is there in this? †The Dead created a community of followers, an extended family, a tribe of Deadheads that were loyal enough to follow them across the country for 30 years. †Would your customers follow your business with that sort of dedication? †There arenít many businesses today that have created that degree of customer loyalty. †Who can we nameÖApple, Zappos, and TOMS Shoes come to mind, and of course there are more. †But think about all the things the Dead did to create customer loyaltyÖthey respected their fans and made it easy for fans to feel part of the band. †In the days before the internet, the Dead had a telephone Hotline that kept Deadheads informed about upcoming tours. †They had a mailing list and kept fans informed via a newsletter and even sent them records from forthcoming releases. †They created a mail order ticket service so fans like me could order tickets for out of town shows which was unheard of in the 80s and 90s. Jerry is gone, but his legacy and the Deadís legacy lives on. †Iíve learned so much from their example. †And you can too. It’s hard for me to believe that it’s been more than 37 years since I first saw the Grateful Dead perform in Des Moines, Iowa on June 16, 1974.† There was the Wall of Sound, and they played nearly 4 hours, but I must admit I wasnít all that impressed with that first show; at that point I didnít yet ìget it.î †All thatís changed, so itís even harder for me to believe how that performance began such a radical change in my life, and how ìlong strange tripî has become so apropos for my lifeís journey. On November 2, 2011 my new book Everything I Know About Business I Learned from the Grateful Dead: The Ten Most Innovative Lessons from a Long Strange Trip will be published by Business Plus.† The book is my attempt to describe part of my strange trip as I explain some of the unique a remarkable things the Grateful Dead did as a business, and how their business was strongly influenced by their improvisational music.† I hope youíll check my blog from time to time as I describe how dramatically the Dead changed the direction of my life, and how telling the story of their business become a major part of my lifeís purpose.